A new group of residents in the Chicago neighborhood of Jefferson Park is organizing for affordable housing and a more heterogeneous community, and winning. Andrea Mitchell knows a dog whistle when she hears one. In the ongoing struggle against housing segregation, they come in the form of chants of “No Section 8.” The fear of a voucher holder’s “miscreant cousin, nephew, brother, son” doing damage in the community. Calls for the children of low-income housing applicants to be screened for criminal records, to rapt applause. For Mitchell, a homeowner in the almost-suburban, majority-white Jefferson Park neighborhood in Chicago, those dog whistles were heard in early February at a neighborhood meeting regarding the proposed construction of a low-income housing development at 5150 N. Northwest Highway, and she decided she had to do something about it. 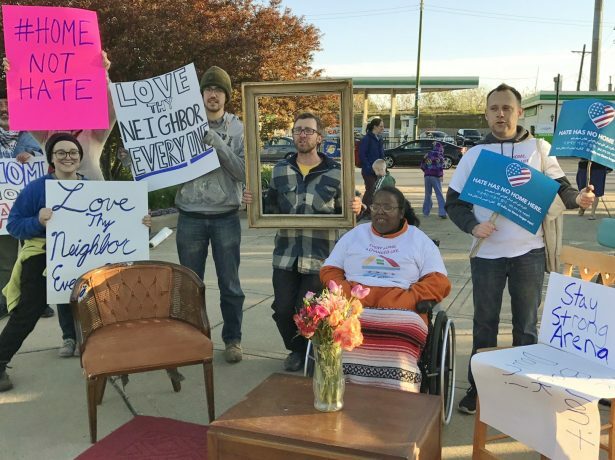 Mitchell and a small group of like-minded residents launched the Neighbors for Affordable Housing in Jefferson Park, or NAHJP, Facebook page in support of the development on Valentine’s Day, just four days after the heated meeting. Leah Levinger, director of the Chicago Housing Initiative, or CHI, a coalition of low-income housing activists, reached out soon after, and within just a month a new activist group was born. NAHJP’s primary goal has been to show Chicago’s City Council that the development’s opposition doesn’t represent a majority of the neighborhood. They’ve done that by building membership through traditional canvassing and community outreach, and then bringing their steadily growing ranks to a series of zoning committee meetings to voice their support. Mitchell cites this as the single most important factor in convincing City Council to approve the development’s zoning. She and her fellow organizers seem at first like unlikely candidates for progressive rabble-rousing. By their own admission, the NAHJP membership are mostly white, home-owning, educated professionals. But in a refrain common over the last six months, Mitchell says she was moved to political action after attending the Women’s March on Washington — and the affordable housing issue made her realize she wasn’t alone. Sara Gronkiewicz-Doran, an early member of the group, described how she was drawn into activism for the first time. In setting their sights on housing, Mitchell, Gronkiewicz-Doran and their neighbors are joining a growing class of homeowners who are eager to establish a more heterogenous culture in their communities. If some of the Northwest Highway development’s opponents have rejected outright racism in favor of classic NIMBY, or “Not in My Backyard,” talking points, criticizing its density and height as affronts to Jefferson Park’s history as a “bungalow community,” then Mitchell and NAHJP could be safely described as representing a Midwestern permutation of the growing YIMBY movement. The acronym, standing simply in opposition to NIMBYism as “Yes in My Backyard,” was coined by academics and activists looking for a solution to the decades-old system of housing segregation and stratification that has led to a historically tight rental market. In Chicago alone, a 2016 study by the John D. and Catherine T. MacArthur Foundation showed that nearly half of the city’s adults were spending more than 30 percent of their income on housing. Groups supporting increased density and socioeconomic integration have sprouted across the country, inspiring recent trend pieces in the Atlantic and the New York Times. The movement’s roots are in historically pricey areas such as New York City and California’s Bay Area, but the existence of groups like NAHJP shows that its appeal extends beyond the domain of the coastal elites. Byron Sigcho is the director of the Pilsen Alliance, an activist group in one of the city’s most rapidly gentrifying neighborhoods. 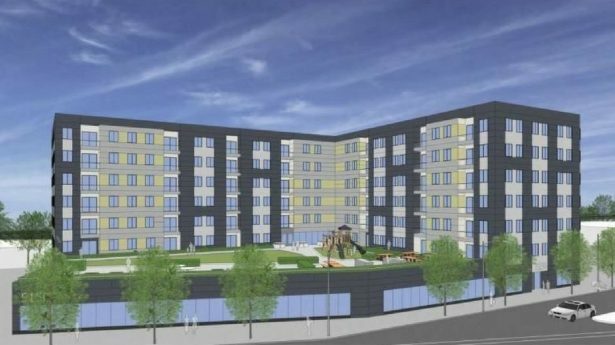 The alliance is currently engaged in a parallel struggle to that of NAHJP, advocating for a massive new residential-commercial complex in their neighborhood to include more affordable units on-site. “In places like Jefferson Park you have a lot of people saying they don’t know how they feel about [an affordable housing] project, where in places like Pilsen you have people begging ‘Please, help us,’” Sigcho said, explaining the ways in which the city’s housing struggles track its history of segregation. He continued, however, to say the universal nature of the housing crisis could provide a way forward for organizers. NAHJP’s activists view deconstructing that dysfunction as a primary goal in their advocacy for the development. They also emphasize, then, the importance of including stakeholders in the organizing process — a crucial task for a group comprised mainly of upwardly mobile white activists. Michael Grice is an organizer with disability advocacy group Access Living, a group that frequently coordinates with the CHI and has been active in the Jefferson Park struggle. Most of the neighborhood’s building stock was built before the passage of the Americans With Disabilities Act, and the planned development would include 30 accessible or adaptable units. He sees the need for stakeholder involvement as a key part of the process. 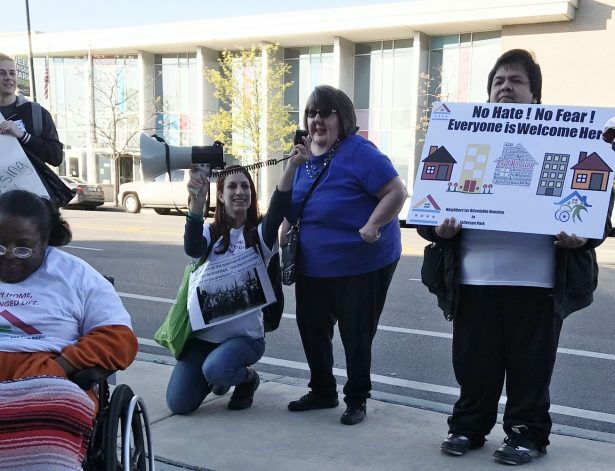 Cathleen O’Brien, the housing community organizer for Disability Rights Action Coalition for Housing, or DRACH, a group under Access Living’s umbrella, praised NAHJP’s efforts to reach out. “They’re wonderful, high-capacity leaders who I think are galvanized and motivated because they want to live in an inclusive community where people who are living in poverty aren’t ostracized,” O’Brien said. That passion was on ready display when a handful of organizers met at the Jefferson Park branch of the Chicago Public Library on a balmy July morning. Gronkiewicz-Doran, Levinger and DRACH’s Laura Donaldson huddled with NAHJP members and their children before fanning out to canvass the neighborhood — the City Council approved the development’s zoning on May 22, but a full vote on the developer’s proposal is yet to come. NAHJP’s goal is to garner as much support as possible in the community not just to push the development through, but to make sure its eventual residents are welcomed with open arms and open minds. Gronkiewicz-Doran knocked on doors up and down Gunnison Street, a pleasantly shady, almost Spielbergian side street lined with single-family homes and low-slung apartment houses. Part of the street was blocked off for a sparsely attended block party, with Jefferson Starship’s “We Built This City” blasting from a rental PA system to a handful of parents standing guard over an inflatable bounce house. Gronkiewicz-Doran steered clear, saying people in the community —for better or worse — view those common spaces as increasingly valuable and rare oases from the world of politics. The people who answered the doors on which she knocked, however, were surprisingly willing to talk, and mostly receptive to her message. 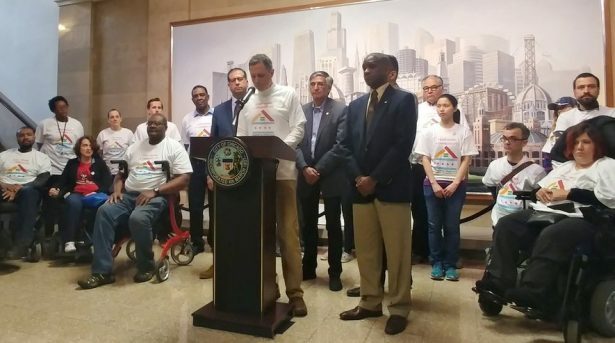 One notable exception was a man who described the development as “Cabrini-Green all over again,” a common refrain of its opponents, who cite the notoriously dangerous housing project demolished in 2011. Gronkiewicz-Doran heard him out, but challenged his points to the finest detail, betraying her day job as a litigator. He ended up taking the literature. At the next home, she was eagerly invited into a second-story apartment by a similarly working-class man who was interested not in organizing, but in getting his name on the apartment’s waiting list. He described the difficulties he and his elderly mother had experienced finding suitably accessible housing in the neighborhood, and thanked Gronkiewicz-Doran profusely as she took his information and described the resources to which they’d be connected. Leaving the house, her eyes grew slightly red. Derek Robertson is a graduate student at the Medill School of Journalism at Northwestern University and a freelance journalist covering policy, activism and culture. Follow him on Twitter at @_gearloose or email him at derekrobertson12@gmail.com.